Although the quirky cover suggests otherwise, The Stinger is not the soundtrack to a movie about the cousin of Spiderman. On the contrary, it’s a bluesy and varied mid-career session of organist Johnny “Hammond” Smith. One of his best recordings on the Prestige label. Smith came up shortly after organist Jimmy Smith’s rise to prominence in 1956 and evolved into a very prolific recording artist for Prestige. A blues-drenched player with an articulate, pianistic style, Johnny “Hammond” Smith’s level was way above the norm. After a stint with Riverside in 1963, Smith switched back to the soul jazz roster of Prestige, stressing a more backbeat-heavy, funky style in the late sixties. (Thereafter, Smith recorded extensively for CTI imprint Kudu) The Stinger marked Smith’s return to Bob Weinstock’s Prestige label. It bears the carefree atmopshere of the after hours joint. At the same time, Smith demonstrates an exceptional ability to master diverse, intricate repertoire. Benny’s Diggin’, for instance, is an uptempo hard bop mover that would’ve sit well on an early sixties Blue Note album. Cleopatra And The Black Knight combinates a lilting bossa rhythm with an eastern-flavored theme. Smith’s solo intensifies the already considerable swing. Smith’s uncluttered storytelling comes through equally well in ballads as in funky tunes. The Stinger, driven by a shufflin’, biting drum beat and an archetypical blues guitar line, is a fiery, down-home cooker. Brother Ray, a “Hammond” Smith tribute to Ray Charles, blends a suave horn arrangement with hard swing. It’s perfect foil for tenor saxophonist Houston Person’s muscular style. It also is ample proof that Johnny “Hammond” Smith simply was one of the finest organists around. 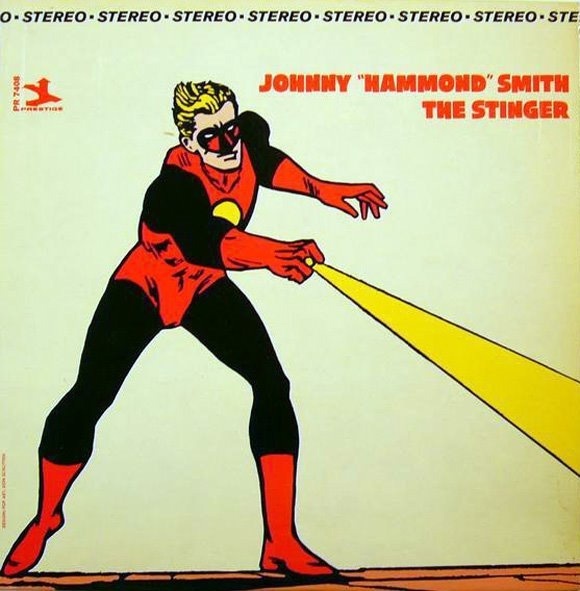 About the spotify link below: The Stinger is the second part of this Johnny “Hammond” Smith twofer. Posted in Review	- Tagged Johnny "Hammond Smith"